At Conklin & Ward Dental Group, we provide premier care for premier smiles, which is why we’re happy to offer the most state-of-the-art missing teeth solution available today: dental implants. Compared to any other restoration, dental implants look better, are stronger, and last longer. Whether you’re missing a single tooth or need full dentures, implants can help you get your smile back and keep it for life. To learn more about this treatment and what it could do for you, contact us today to schedule a consultation. Dental implants are posts inserted below the gum line that mimic the function of healthy tooth roots. These implant posts are inserted into the gum line where they mimic the natural function of tooth roots. Once in place, the implant posts fuse with the bone and soft tissue, recreating natural stability and providing support for any number of replacement teeth. The dental implant process begins with a consultation in our office, where we’ll determine if you’re a good candidate for the procedure. Then, we’ll plot out the course of your treatment, including preliminary work, the implant placement surgery, and the restoration phase. Overall, your implant journey may last several months to a year. When all is said and done, you can expect to have a beautiful and strong smile that stands the test of time. All types of dental implants look and function in much the same way, but there are an array of options available. Each implant post is precisely crafted to meet the patients’ unique specifications. They can be crafted from a number of high quality materials, including titanium and zirconia. The material used will depend in large part on the patients’ health and specific treatment needs. Before we begin your implant tooth replacement plan, we’ll walk you through your options and help you find the one that best fits your needs and budget. The dental implant is actually surgically placed directly into the jaw in order to mimic the root structure of a lost tooth. This not only provides an extremely sturdy base for the replacement teeth, but it also prevents and even reverses the bone loss that is common after tooth loss. No other tooth replacement treatment can accomplish this. In order to have dental implants placed, you will first need to undergo a minor surgical procedure. This is performed by our in-house periodontist, Dr. Melody Ward, so you receive the very best care without having to leave the comfort of our office. After the surgical procedure is completed, you’ll be given 3-6 months to heal, during which the implants will bond to your jaw through a natural process called osseointegration. Then, you’ll return to our office to receive your new teeth. In the case of a single missing tooth, we’ll use something called an implant-retained crown to replace it. This will consist of three parts: the implant itself, a custom-made all-porcelain crown, and an abutment. 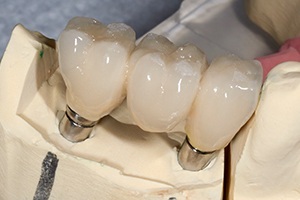 The crown will be connected to the implant using the abutment, and after that, it will be virtually indistinguishable from your real teeth. You’ll be able to rely on it just like the rest of your smile, and you’ll even be able to maintain it with just routine brushing and flossing. If you are missing multiple teeth in a row, two of these implant crowns can also be used to form a bridge. 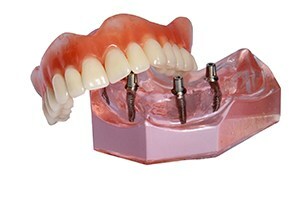 Two implants will support either end of these fixed bridge prosthetic teeth to close the gap in your smile. Compared to a traditional bridge, implant-retained bridges look more natural, are stronger, and can be trusted to last longer as well. Tired of your uncomfortable dentures moving around in your mouth all the time? With dental implants, we can give you a set of teeth that is always rock-solid. For implant-retained dentures, a custom-made prosthetic will actually snap onto numerous dental implants placed into your jaw. 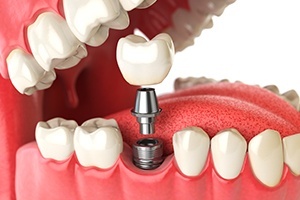 Compared to removable dentures, implant dentures have a much more secure hold, the fit is way more consistent, and it also allows a patient to enjoy a stronger bite as well. Now, you’ll be able to enjoy all of your favorite foods with ease! Dental implants have a success rate between 95 and 98% after five years. This success rate varies based on the age and health of patients, type of implant posts used, and a number of other factors. Other tooth replacement prosthetics like traditional bridges and dentures have a much lower rate of success after five years usually between 60 and 75%. 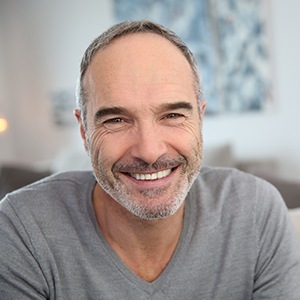 Dental implants offer a significant improvement in longevity, and most last for two or more decades without the need for repair or replacement. Longevity – unlike traditional tooth replacement using bridges or dentures that need to be replaced every five to ten years, implant supported restorations can last for decades with proper care. In fact, many patients are able to maintain the same implant retained prosthetic for the rest of their lifetime. Improved stability – traditional tooth replacement methods only restore the parts of teeth above the gum line making them a weaker alternative to healthy tooth structures. Implants replace the root structures of teeth, closely mimicking the natural design and function of natural smiles. For this reason, they create more lifelike stability, especially compared with the more advanced partial and full dentures. Traditional dentures at best restore 20% of chewing ability. Implant supported dentures more than triple that replacing 70% or more healthy chewing function in most cases. Improved oral health – because the implant posts provide stimulation for the jawbone and soft tissue, they actually improve oral health for patients who have lost one or more teeth. The stimulation they offer helps to maintain bone density and gum tissue volume. This prevents the sagging and changes to facial shape that are common for patients with traditional tooth replacement like partial and full dentures. For those patients with healthy teeth remaining, this also reduces risk for further tooth loss.